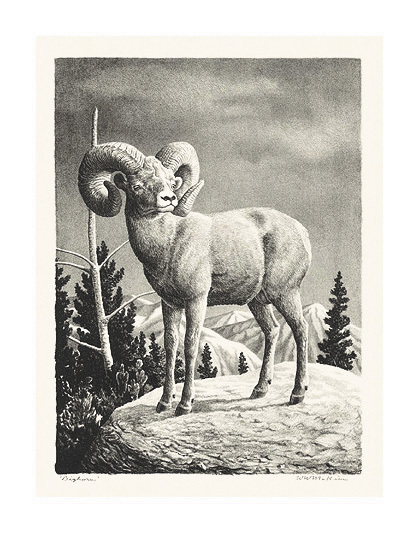 Bighorn - - 1940, Lithograph. 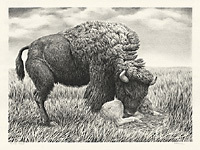 Image size 11 13/16 x 8 11/16 inches (300 x 221 mm); sheet size 19 7/8 x 13 inches (505 x 330 mm). 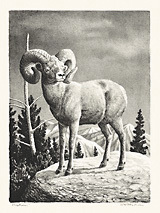 A fine, rich impression, on cream wove paper, with full margins (2 to 4 1/4 inches). A soft crease across the top right sheet corner, well away from the image, otherwise in excellent condition. 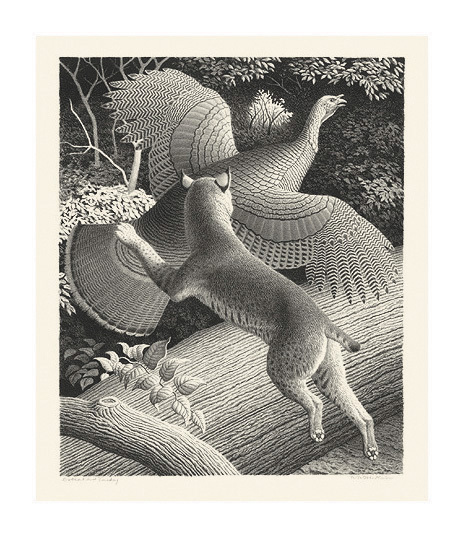 Bobcat and Turkey - - 1961, Lithograph. Image size 14 1/8 x 11 5/8 inches (359 x 297 mm); sheet size 21 1/2 x 17 3/4 inches (546 x 451 mm). A fine, rich impression, on off-white wove paper, with full margins (3 to 4 3/16 inches), in excellent condition. 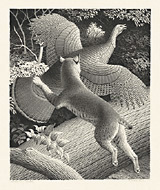 The artist's painting Bobcat and Turkey is illustrated in Under the Influence, The Students of Thomas Hart Benton, The Albrecht-Kemper Museum of Art, 1993. 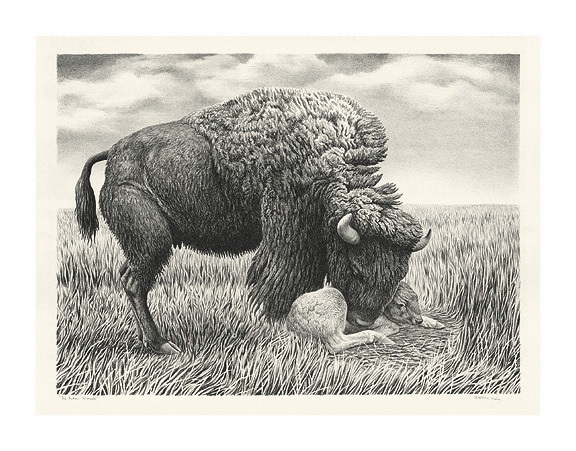 No New World - - 1965, Lithograph. 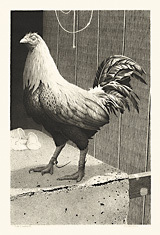 Image size 15 1/4 x 20 3/4 inches (387 x 527 mm); sheet size 20 x 26 inches (508 x 660 mm). A fine, rich impression, on off-white wove paper, with full margins (2 1/4 to 2 5/8 inches), in excellent condition. 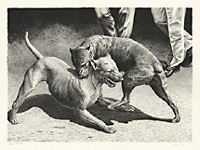 Pups in the Pit - - 1967, Lithograph. 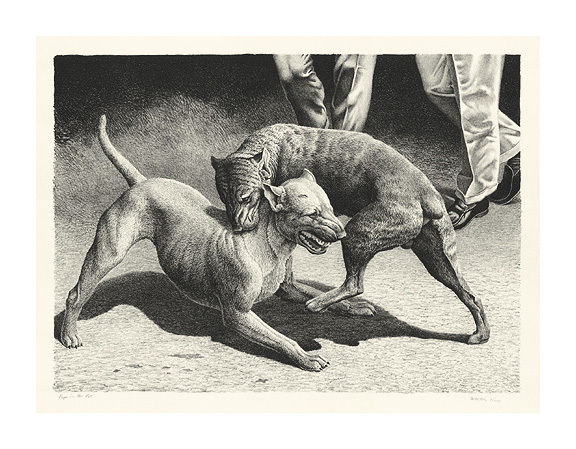 Image size 15 5/16 x 21 1/4 inches (389 x 540 mm); sheet size 18 x 23 1/2 inches (457 x 597 mm). A fine, rich impression, on cream wove paper, with full margins (1 1/8 to 1 1/2 inches), in excellent condition. Illustrated in Under the Influence, The Students of Thomas Hart Benton, The Albrecht-Kemper Museum of Art, 1993. 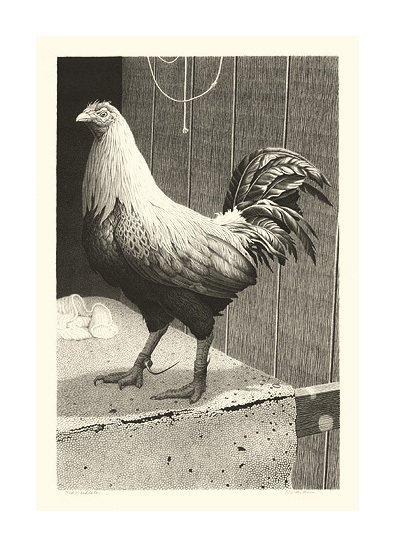 Old Gladiator - - c.1975, Lithograph. Image size 19 3/8 x 12 11/16 inches (492 x 322 mm); sheet size 23 1/2 x 17 inches (597 x 432 mm). A fine, rich impression, on off-white wove paper, with full margins (2 to 2 1/4 inches), in excellent condition.